George Chamberlain Duncan was born on 11 February 1917 in Tacoma, Washington, and graduated from the United States Naval Academy, in Annapolis, Maryland, in June of 1939. After two years on the battleship USS West Virginia (BB-48), he was accepted for flight training at Pensacola, and earned his wings in mid-1943. However, he did not join Naval Fighter Squadron 15 (VF-15) on the aircraft carrier USS Essex (CV-9) until September of 1943. Flying F6F Hellcats, he ultimately flew 54 missions, but did not score his first victory until June 15th, 1944, when he shot down a Japanese Zero over the island of Iwo Jima. A few days later, on June 19th, during the famous "Marianas Turkey Shoot," which was part of the Battle of the Philippine Sea, Duncan claimed three more Zeros. He earned his "Ace" status on September 12, when he destroyed two more Zeros over the Philippines. 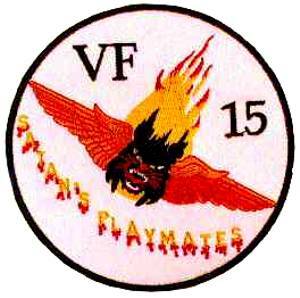 The next day, again over the Philippines, he claimed one Oscar, one Nate, one Betty bomber, and shared credit for another, running his total to 9.5 aerial victories, and by early November of 1944, he had shot down four more Jap fighters, making his war total 13 and a half "kills", and having earned the Navy Cross, Silver Star, and the Distinguished Flying Cross. After World War II, Duncan attended, and graduated from the third class of the Navy's Test Pilot Training in December of 1949 (during which time, he had collided a Vought XF6U-1 with the ground on takeoff, and crashed into the Patuxent River). With his test pilot credentials, Duncan was assigned to the Carrier Suitability department of the Navy Flight Test Division at Pax River, and flew in what would be the first carrier landing and takeoffs of the Grumman F9F Panther. The Panther, the Navy's primary jet fighter and ground-attack plane, scored the first air kill by the US Navy in the Korean war, when on July 3rd, 1950, LT JG Leonard H. Plog of Naval Fighter Squadron 51, flying an F9F, shot down a Yak-9. Powered by a Pratt & Whitney J48 turbojet engine with 7,000 pounds of thrust, the assigned aircraft - Bureau # 125228 - was hoisted aboard the USS Midway (CV-41) at Norfolk, Virginia, and carried out into the Atlantic Ocean. There, Duncan and his plane were catapulted, and trapped by, the carrier without any problems. But on the second test flight, as Duncan was coming in for his trap landing, he was lined up to catch the third wire, strung across the carrier's flight deck. But, without any warning, the descending Panther caught an air pocket, and dipped below the flight deck. Duncan pulled back on the stick, then saw nothing but flames! 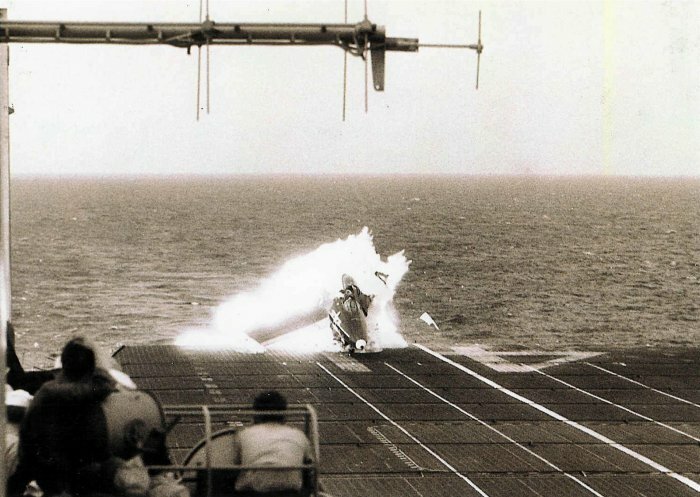 Duncan had managed to kick the nose of his plane upwards just as the plane smashed into the edge of the carrier's deck, splitting the jet in half. 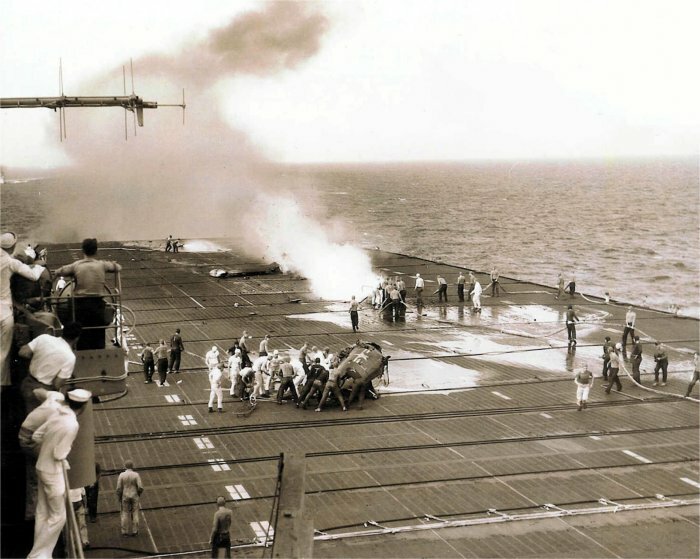 From behind the cockpit to the nose of the plane, the partial fuselage violently tumbled and rolled down the deck of the carrier, as the remaining chuck of the plane, and its fuel, ignited into a fireball and chased Duncan's cockpit down the deck. The force of the impact popped the canopy off of Duncan's cockpit, as well as his helmet. But amazingly, he was still strapped into his seat, and alive. Skidding to a stop, deck hands on the flight deck rushed to Duncan's aid, and pulled him from the fiery remains of his jet, and rushed him to the sickbay. Duncan was burned by the fireball, and his ears were badly scorched, but he was otherwise unharmed by the crash. Several months later, Duncan was back flying. As nearly every landing on an aircraft carrier is filmed, for educational and safety purposes, footage of Duncan's crash circulated throughout the fleet, as a lesson in what could happen on the open seas. F9F Panthers were withdrawn from front-line service after the Korean War in 1956, but remained in training roles and with reserve units until 1958, some continuing to serve in small numbers into the 1960s. 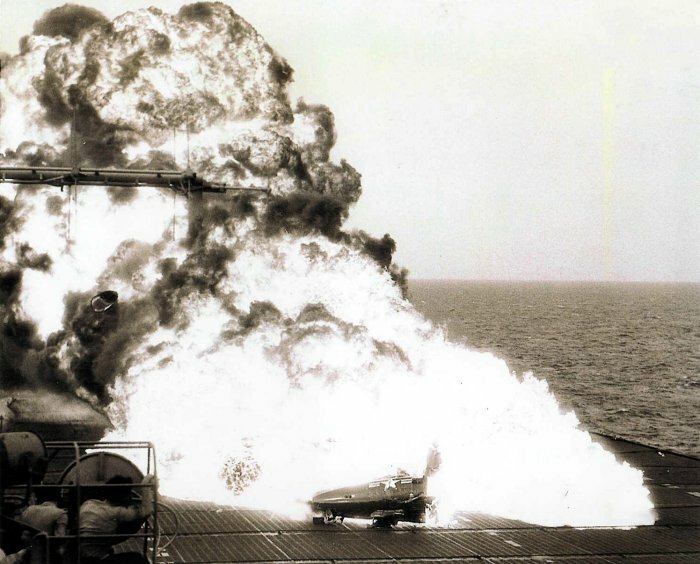 Film footage of this accident was used as a SB2C "Helldiver" striking the ramp before turning into an F9F "Panther" jet fighter bomber as it explodes, in the 1976 film "Midway". n addition to its use in "Midway", Commander Duncan's crash was featured in 1954 movie "Men of the Fighting Lady " as the demise of Keenan Wynn's Lt. Cdr. Ted Dodson and later in the 1990 film "The Hunt for Red October" as a damaged F-14 "Tomcat." He continued to serve in the Navy, rising to command Naval Fighter Squadron 51 (VF-51) and Air Group 5 during the Korean War. He went on to become the captain of the USS Ranger for over a year, and after serving in the Navy for 33 years, he retired in 1968 to become a Washington area lawyer. He passed away on December 15th, 1995. George Duncan's experiences on that June day are covered in George Wilson's book about the Naval Test Pilot School at Patuxent River, entitled Flying the Edge. The USS Midway remained in the Navy until April 11th, 1992, when is was decommissioned. In 2004, she became a museum ship in San Diego, California, and is open to the public.